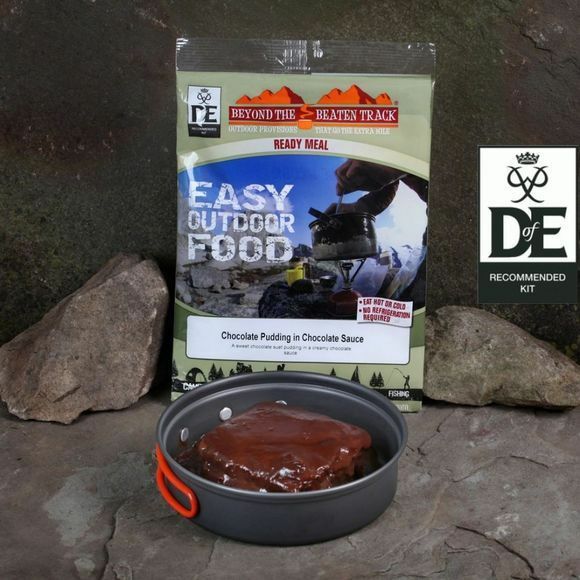 Add some luxury and comfort to your wilderness dining experience with a rich tasty Beyond The Beaten Track Chocolate Pudding in Chocolate Sauce. It’s ready to eat hot or cold, has a long shelf-life, and does not require refrigeration. Chocolate sauce (70%) (water, chocolate chips (10%), sugar, single cream (7%), modified maize starch, cocoa powder, cream powder, stabiliser: E461; skimmed milk powder, whey powder, emulsifier: E481), chocolate pudding (30%) (wheat flour, sugar, water, vegetarian suet, skimmed milk powder, cocoa powder, salt, vegetarian glycerine, raising agents: E450, E500).